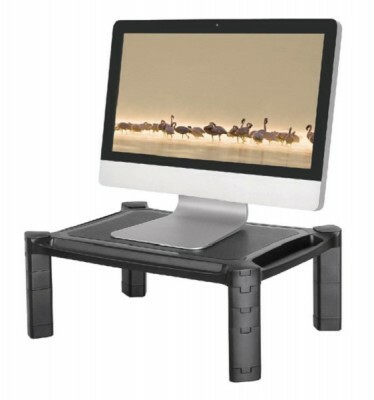 The NewStar NSMONITOR20 is a desk riser for flat screens and laptops up to 10 kilo. By using a riser for your monitor or laptop you can place the screen on the required height, avoiding neck- back and shoulder complaints. The height of the riser can be changed between 4,6 and 16,8 cm. In the sleeves on the frontside and two backsides you can tuck away things like a tablet or pencils so your desk is clean. Cables can be guided through the cable router on the backside of the NSMONITOR20.